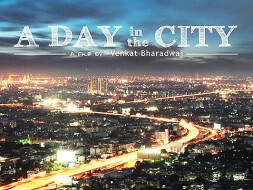 Fundraising to support our independent Kannada film "A Day In The City" to reach a wider community. “A Day In The City” is a Kannada commercial feature film was released in Feb 2015. The movie is based on the theme of water conservation with the idea to deliver this message to citizens. The film explores how government officers function and talk about topics such as effective governance and national integration. The film is about an incident that happens to an Indian city and how things get worse as the situation escalates. This specific incident creates panic in the entire city and the public suffers. The story revolves around how this situation gets solved. This movie is an eye opener for Indian citizens. Every little contribuion of Rs. 500 or more could help us promote our film to a wider audience. If you cannot contribute for whatsoever reason, please share it on Facebook, email or any other social tools to your friends and family. We need your support to tell this beautiful story of water conservation in a city like Bengaluru.